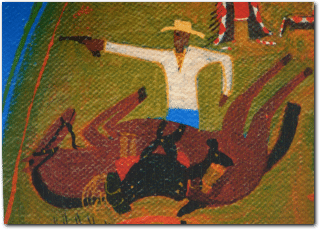 Powerfully titled The Battle of Greasy Grass, artist Allan Mardon depicts the controversial history of the Battle of Little Bighorn. 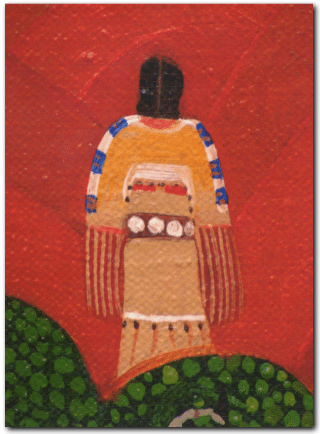 The title derives from the Lakota name for the battle, termed after the “greasy” appearance of the grass in the waters near the battle site. The composition of the work presents duration of time by capturing the significant moments between 3 p.m. June 25, 1876, to 3 p.m. June 26, 1876Striving for historical accuracy, Mardon gathered modern accounts from Native Americans and formulated a contemporary composite that includes individuals unrecorded by others like Paxson—Cheyenne witness Kate Bighead, Bismark Tribune reporter Mark Kellogg, and African American scout Isaiah Dorman. Why are there two norths? 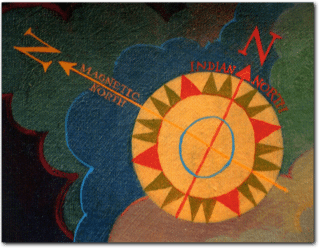 The soldiers judged direction by using the magnetism of the North and South Poles, while the Indians used the position of the stars, sun and moon to guide them. Because Custer’s men and the Indian warriors found their way by using different methods, the north of the soldiers did not point in the same direction as the north of the Indians. This could explain why the soldiers’ accounts of the Battle of Greasy Grass were different from accounts told by the Indian warriors. Who is this? This is Crazy Horse, an Oglala (Sioux) warrior. He is featured twice in this painting. He is shown to the left of Custer Hill (see image on reverse side) and riding with Sitting Bull, to the left of Reno Hill. Why is Crazy Horse covered with white spots? According to Indian accounts, when Crazy Horse was a child, he spent three days on a hilltop without food or water. He was waiting for a holy sign and put pebbles between his toes and rocks under his head so that he would not fall asleep. Crazy Horse had a vision. He saw a long-haired warrior, who could not be harmed with bullets or arrows. Crazy Horse did not speak of his vision until he was sixteen years old. From then on he painted white hailstones on his body and drew a streak of lightning from his forehead to his chin before going into battle. A camp of “seven circles” (Hunkpapa, Oglala, Minneconjou, Sans Arc, Brule, Cheyenne, and Blackfeet Indians) is set up along the bank of the Greasy Grass River (also called the Little Big Horn). People are digging for wild turnips, swimming in the river, and doing their daily chores. Long Hair (the man that some call Custer) doesn’t know it, but there are almost 10,000 people camped here and about 3,000 of them are warriors! Several young warriors run into the camp to tell the people that there are soldiers coming. Everyone is surprised and not ready to fight. Sitting Bull was an important Hunkpapa (Sioux) spiritual leader and many of the Plains Indian people respected his advice. 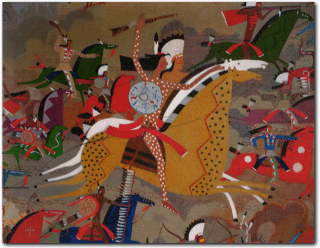 During the Battle of Greasy Grass, Sitting Bull traveled to different parts of the battlefield. 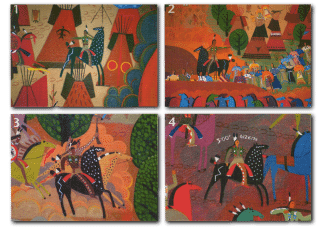 Since this painting shows what is happening over a twenty-four hour period, Allan Mardon has chosen to show Sitting Bull four different times. Picture #1: Sitting Bull is shown in the camp of “seven circles” praying with the tribes. 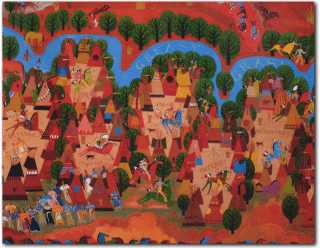 Picture #2: Sitting Bull leads the women, children and elderly men to safety. Picture #3: Sitting Bull is seen riding with Crazy Horse, to the left of Reno Hill. Picture #1: Majors Reno and Benteen take their troops to Weir Point, after having been convinced by Captain Weir and Lieutenant Edgerly that they should help Lieutenant-Colonel Custer. 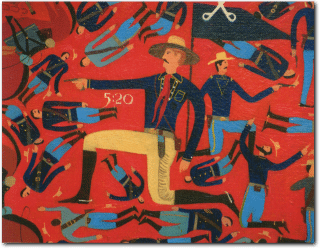 Reno and his officers can see the Indian warriors on top of Custer Hill. The Indian warriors are shooting at the wounded soldiers lying on the ground. The mounted Indians are using army guidons (company flags on poles) as coup sticks. Coup sticks are weapons that the Indians used to touch their enemies in battle. Picture #2: The Indian warriors have spotted Reno and his troops. 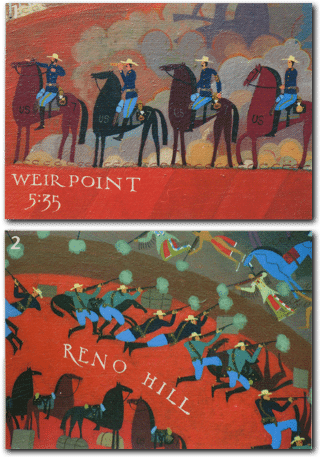 Reno’s troops retreat to Reno Hill. Isaiah Dorman is the only black man in this battle. He is a translator and scout for Custer’s army. Dorman dies during the battle. Isaiah Dorman was hired by the war department in 1865 (after the Civil War had ended) to serve as a courier (a mail carrier). He was paid $100.00 a month. (This was a lot of money in 1865.) Each month Dorman traveled almost 100 miles, on foot, between Fort Wadsworth and Fort Rice. He walked with his sleeping bag tossed over his shoulder and the mail wrapped in a waterproof cloth. Each trip took five days to complete. He did this work off and on for about two years and then disappeared. He spent most of his time with the Sioux and married a Santee (Plains Indian) woman.